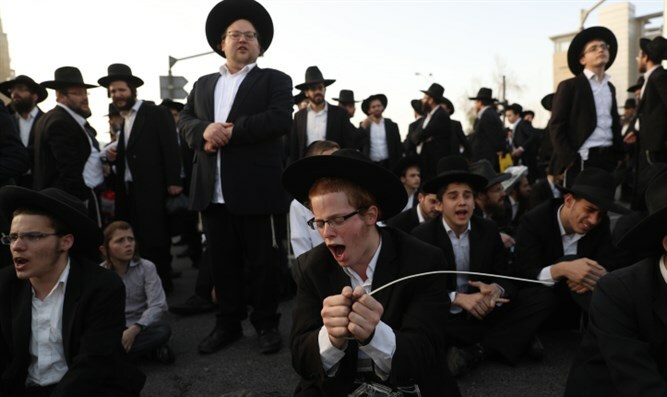 Yerushalmi Faction takes to the streets over expected passage of Draft Law. Rally expected to paralyze Bnei Brak, Jerusalem. The extremist Yerushalmi Faction (Jerusalem Faction) will block major thoroughfares in both Jerusalem and Bnei Brak in order to protest the expected passage of the Draft Law. The central rally in Bnei Brak is scheduled to start at 5:30 p.m. at the Ponovezh Yeshiva and extend to Kahanamen Street. Police told the Behadrei Haredim haredi website that it would act to ensure the safety of both the demonstrators and the general public. "The police are prepared for protest and will act to ensure the safety, security and safety of the participants and, no less important, ensure that the protest does not unduly harm the daily life of the general public and is carried out under the law," said the police in a statement. "The freedom of expression and protest is a right of any citizen who desires. At the same time, we will not allow any disturbance of order and violence of any kind. " The Yerushalmi Faction has orchestrated a series of protests and road-blocking demonstrations nationwide in recent years. The extremist group is angry over the government's intent to pass the Draft Law, which would obligate some yeshiva students to perform military service. The government appealed to the High Court of Justice on Sunday to extend the deadline to pass the haredi Draft Law for another seven months. In 2015, the Netanyahu government amended a draft law passed the previous year which had imposed limits on the number of permanent full-time yeshiva students eligible for draft deferments from the IDF, limiting the number of years most students would be eligible for deferments. In 2017, however, the Supreme Court intervened, throwing out the 2015 law and giving the government until September 2018 to pass a replacement. Without new legislation passed by September, thousands of yeshiva students could find themselves unable to renew their annual deferments, making them potentially liable for the draft. With the deadline looming, the government has been frantically trying to pass the Draft Law before the Knesset's summer session ends. However, the haredi factions have been unable to find common ground on the law's wording resulting from an internal power struggle with the hassidic community.